¿Habla español? Vea nuestra página de recetas. 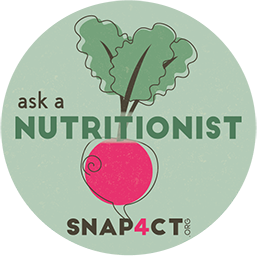 SNAP4CT is your source for healthy, budget-friendly recipes, Connecticut farmers markets, and tips for healthier living. Learn more About Us. Ask your nutrition questions. It's Free! Find FREE Health Events in CT.
Read our Husky Nutrition 2018 Annual Report. Get Grocery Shopping Tips that will help you save $$. Spring is finally here! To celebrate we are lightening up our meals. This Colorful Farro Salad is a great choice, and it will work well as an Easter side dish. SNAP4CT.org is a program of UConn Health. We provide health and nutrition information for people who receive SNAP (Supplemental Nutrition Assistance Program) benefits. Learn more... Thanks for visiting!